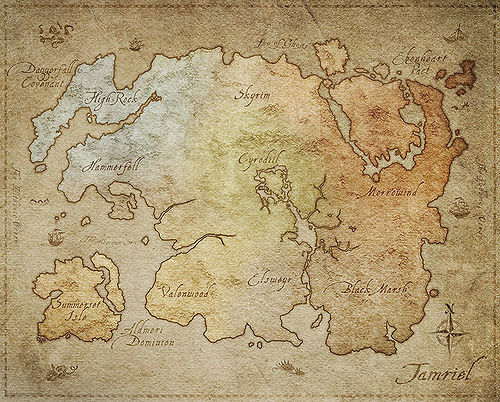 This is a general hub page for all relevant maps related to The Elder Scrolls Online. Individual locations can be found through the places page. Each zone and many cities have a map on their respective articles. Every individual cave, ruin and dungeon has maps provided in its article. See Places for a list. Cyrodiil Unmarked Locations — A map showing the unmarked locations and area names within Cyrodiil. On the compass and map, icons for locations first appear when you get near to that place, or if you have been previously told about it. Once "Discovered", the icon will always be shown. White icons are places that you have "Cleared" or "Completed", while black icons indicate locations that are "Incomplete". Some locations cannot be completed, and these turn white as soon as they are discovered.